The sun is supposed to shine here today–for the first time in three whole days! I’m feeling almost giddy at the thought of finally saying good-bye to winter, and I’m ready to ‘spring’ into another edition of The Hodgepodge. As always, thanks to our hostess, Joyce, for hosting and providing the questions. I’d rather plant a garden! We have two rows already planted, and are waiting for the ground to dry out, so we can plant more. I’m not sure if it will be dry enough to plant on Thursday or Friday, but we’re hoping! The uppermost thing in my mind is when Brad and Jennifer announced, last spring, that they were expecting a baby! (This was something all of us feared might not ever happen.) Now we have another adorable little grandson, Evan William, who will soon be 5 months old! I prefer to sit in the middle section, about 3/4 of the way back. Sadly, it’s been over 3 years since I last sat in a movie theater, and I was watching Toy Story 3! These days, I prefer watching movies at home. I’m shy, so I always hope people are able to realize this and not think I’m ‘stuck up’ or unfriendly when I don’t have a lot to say. Once I get to know someone, I become a lot more talkative. Frozen breakfast waffles, plain or blueberry. I try really hard to avoid any kind of family squabbles, especially involving our children/spouses. About three weeks ago, we had a bit of a phenomenon happen in our community, when a set of Quarter Horse twins were born here, on February 25. This is quite a rare occurrence–only 1 in 10,000. 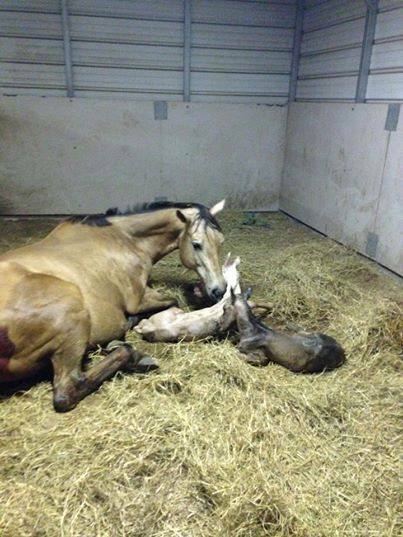 The mare, a horse named ‘Vicki’, gave birth to two fillies. Unfortunately, when twin births do happen, it sometimes means death for all, since horses’ bodies aren’t built to carry and deliver twins. Sadly, Vicki lived to see her babies, but suffered ruptured intestines during the births, and had to be put to sleep. Afterward, it was a mad scramble to find nurse mares to feed the twin foals. Baby “A”, the brown foal, was named ‘Victorious’, while baby “B” was named ‘Grace’. Nurse mares were secured for both fillies, while the horse owners took turns doing round the clock bottle feedings, as well. The weaker of the two, ‘Grace’, (the white one) had a difficult time (her nurse mare dried up, among other things), and Grace, ultimately, passed away a few days later. Victorious continues to survive and seems to be doing well, so far. 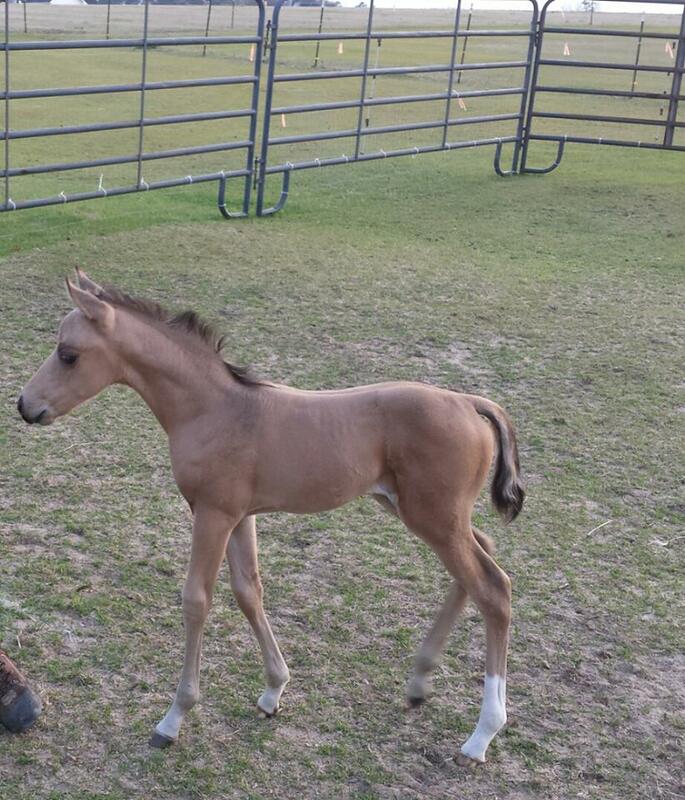 I check her progress almost daily through the Facebook page Claxton’s Quarter Horse Twins. She’s a sassy little one, and I enjoy the pictures and videos they post of her. I do not know the owners, but I do love animals, and the story, which was on the local news, captured my heart. I’m hoping Victorious will continue to live up to her name! How very sad about the Quarterhorse. :-((( they’re such beautiful creatures. I hope Victorious follows her name and makes it through. So beautiful! Finding out about a new grandchild is a wonderful surprise. I like avoiding squabbles as well. Victorious is a beautiful little filly! Love animal babies! Oh what a sad, sad story about the horses. I hope Victorious continues to thrive, and please keep us posted now and then!! I enjoyed you Hodgepodge!! What a sad story but happy at the same time since Victorious seems to be thriving. Yeah, I hate squabbles too…of any kind! That’s such a sad story. Hope Victorious remains victorious. Maybe she’ll want to change her name to Victoria. Interesting about the horses and sad. I too hope the little filly thrives! I’m bawling…poor things!! I do hope Victorious continues to thrive and survive to carry on Vicki’s genes for the next generation. But from that sad note…I must admit your 2nd answer made me swell with a good feeling all over!!!! Of course your answer would be plant a garden and you have the best I’ve ever seen. I have to get active, I’m so tired of being out of shape. Wish we could be walking buddies. The story on the horses brought me to tear. A beautiful miracle filled with so much sadness.